It’s not just adults who need set luggage that features a carry-on, medium, and large suitcase; for long travels your kids will need sturdy space maximizing suitcases just as much as you do. For instance, these sets typically offer a full-sized luggage option around 14 to 15 inches (kid sized) with telescopic handle and haul handles, and then include a lunch-box sized kit, or even sometimes a purse/etcetera. These extras give your kid more packing room and organizational space, as well as the option to pack and customize their travel experience the way they want to; after all, it’s all part of growing up. Our two particular suitcases under review today are the Disney Girls’ Princess Set and the Marvel Boys’ Guardians Set from competing brands who are at the forefront of production in children’s luggage. 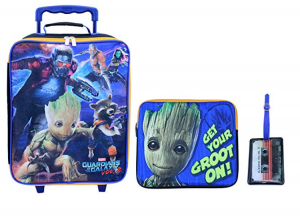 Of course, don’t let titles be deceiving, because we definitely think boys can enjoy princess suitcases just as much as a girl might want a Guardians of the Galaxy suitcase. The following reviews are organized into four categories: suitcase storage, materials/durability, additional features, and size/style options. 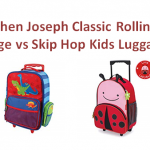 For each suitcase and the brand associated with it we’ve broken down all the facts in order to compare these products side by side so that you, our readers, might have an easier time judging for yourself what the right luggage selection is for your kid’s needs. 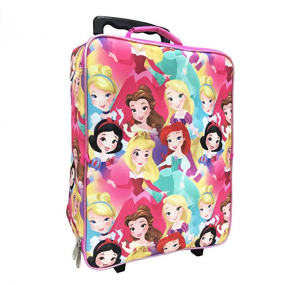 The fun-loving Disney princess suitcase features a vibrant print with (you guessed it) princesses, but since this is a luggage review our main focus was on all the other features just as much as style! Disney Girl’s Princess 3-piece luggage set is designed with a main 14-inch roller suitcase and includes a princess pencil kit/side satchel, as well as a clip to your suitcase circular princess purse. What’s most enjoyable about this configuration is that its not just luggage; this set includes things your kid can just take to school as easily as they would take them onto an airplane. At 14 inches the suitcase is designed with a cube-type shape for fitting more clothing and extras at the expense of a little extra rolling width. 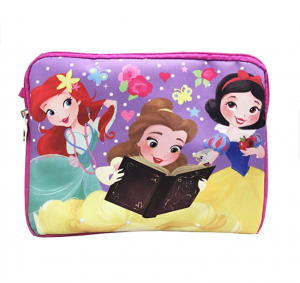 Storage is made up from this main zippered compartment which has a single opening lid without ceiling pockets, but offers extra organizational space by way of an included pencil pouch and circular princess purse. Although extra pockets or tie-down straps would be nice and help with containing clothing a little better, the cube dimensions of the carry-on suitcase allow for extensive packing – at least 4-5 different outfits and pajamas! All three pieces in this princess luggage set are made from polyester with a high denier rating; this means the children’s suitcase offers a medium-low durability that’s ideal for a carry-on but not great if you wanted to check the bag. Luggage which will offer a high durability should be made from either cotton canvas (medium durability) or nylon (highest durability). Some durability adding features which are fairly impressive for just a children’s suitcase are the in-line skate wheels made from strong polyurethane and capable of handling anything from the airport to cobbled urban streets, as well as the telescopic two-pole handle made from aircraft-grade aluminum. Other features of note include strong zipper pulls (also made from aircraft grade aluminum), and a watertight interior lining inside the main 14-inch suitcase. Where the purse is concerned, this circular case has a line made of strong webbing that can clip directly to your son or daughter’s suitcase. Finally, the pencil case is also semi water resistant and very deep for fitting all kinds of things your child might need on their travels be it toiletries or diapers! When you’re done getting things out of the case, its thin enough to slide comfortably right inside the suitcase for easy storage on the go. Measuring 6 x 11.8 x 14 inches the main print on the carry-on suitcase reflects the style options for this luggage set. The iconic princess print features all of the essential princesses from Disney’s original Snow White all the way to the newest additions like Else and Anna from Disney’s Frozen. 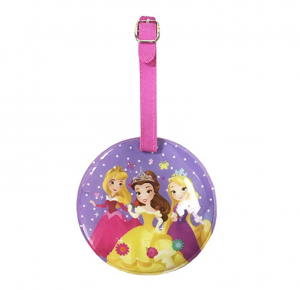 Likewise, your son or daughter will have princess companionship when taking the pencil kit to school, or putting their airline ticket safely inside that super cool circular purse. If you’re a parent of any child under 12 then you’ve probably heard about Guardians of the Galaxy and you might even have watched it for the 18 or 19th time recently. This luggage features a Guardians of the Galaxy print which any young fan of the movie will find adventurous and really get excited about. It’s also a luggage set and so beyond the wheeling 14-inch suitcase you also get a smaller kit for a tablet or to use for carrying pencils, books, etcetera; the third and final piece being a clip-on hanging wallet designer to look like a cassette tape. So, how does this compare to the Princess Luggage Set? Well, beyond being a superhero print, we’ve looked at all the extras and how they might affect the value of the luggage overall, including the value of your traveling experience whether its across the globe or just over to Grandma’s house. At a maximum of 14 inches and manufactured with a cube shaped interior this is a great luggage option that’s easy for your son or daughter to handle and also fits between 3 to four outfits with room still for pajamas and fitting the tablet case. Added storage comes from this included tablet case which can be used to protect electronics and is built with a cotton canvas durability, and can interchangeably be used to carry toiletries as well as pencils and other belongings to keep your child entertained during long travels. 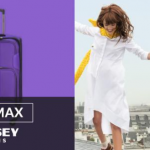 This suitcase compares pretty evenly against the Princess Luggage Set when it comes down to durability; both suitcases use polyester. This material adds to the vibrancy of the prints but isn’t nearly as durable as a suitcase which would use cotton canvas or nylon materials. What this should mean for you as a parent is that this children’s carry-on is best protected and used only as a carry-on and not as a checked suitcase. Where the Guardians of the Galaxy Set is concerned, it makes up some durability with fine quality polyurethane in-line skate wheels as well as the telescopic two-pole aluminum handle. Beyond the face value of its fun print this suitcase offers the added features of a protective IPAD case (made from a blend of cotton canvas and polyester), and this case isn’t exclusively for electronics but can be used to store other valuables, toys, pencils, and books. Also included in this set is a hanging wallet with a ‘cassette tape’ print; this wallet clips directly through a belt loop on a pair of pants or can be secured tightly to the suitcase itself. The wallet is great for carrying travel papers, a nametag, and other personal details which will help add to your sense of security, as well as their safety, when you’re traveling with your child or they’re traveling unaccompanied. This children’s carry-on measures in at 14 x 11.75 x 6 inches and has plenty of packing space with room to spare. The print itself is limited to the Guardians of the Galaxy design, but it’s a fun print which features the iconic characters from the movie and will add a bit of fun to any travel. It’s a small suitcase that any child over 6 will have no trouble handling, and when tuckered out at the end of long travels the handle can even extend long enough for an adult to wheel it alongside them. Comparing the suitcases in this review against each other is actually pretty difficult since they’re both great examples of kid traveling accessories with great room for outfits and all the other important extras. Where their durability’s matter these suitcases, both use polyester materials in the design as well as strong in-line skate wheels and a durable two-pole telescopic handle. Likewise, style options are limited to the single Princess or Guardians prints, and so choosing between the two is more a matter of preference than a true difference of value. For storage space there is a little bit more room using the purse included with the Disney Girls Set, whereas the wallet is somewhat space limiting, but this is really the only major difference between these two fantastic children’s travel brands.